Unless you are used to having acid flashbacks, you probably have noticed that something is a little bit off in this photo. The sky is all orange and blotchy looking and the water by the shore of the point is almost washed out it is so bright. The tree looks ok - pretty sharp and defined. 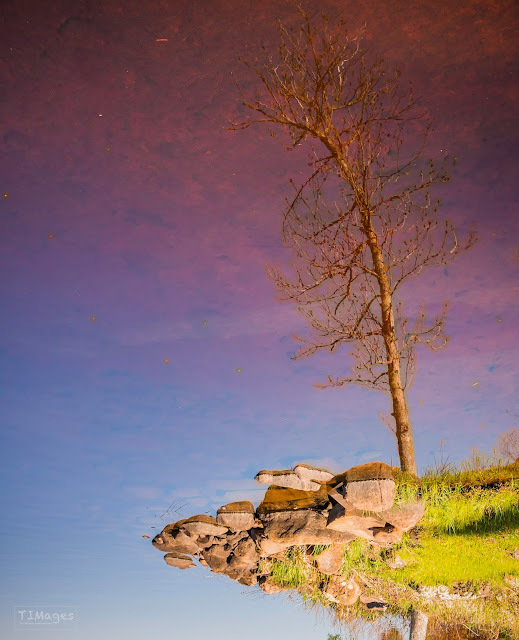 The photo is actually upside down and that is the reflection of the tree on our point in the lake - the orange tint is from the tanic acid of the tamarack swamps that feed the lake. Those are rocks on the bottom, about 4 feet at the deepest in this picture. The water is clear and clean, just tinted the color of root beer. Makes for good waterfall shots.